Have you seen my Many Ways to use a Metronome? I've now released it as a kindle book as well. Many people find metronome practice awkward or dull, and some beginners find it hard to get started with it at all. That's not too surprising. After all, you don't expect to just pick up an instrument and play it until you learn the technique - much the same applies to metronome practice. 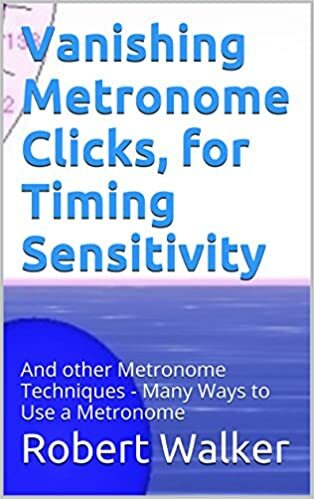 This is a compilation and overview of some of the ideas for metronome practice developed and written about by musicians and music teachers, together with a few extra thoughts and ideas. If you haven't come across this before, it's sure to help bring new life into your metronome practice sessions. There's a whole technique to metronome practice, but few musicians seem to know about this (including many music teachers also). That's why it's often hard or frustrating to use a metronome, or you may find it doesn't seem to help as much as it should. Many give up, and other musicians discover these ideas for themselves, over and over again, not knowing that the technique already exists, and has been worked out in great detail. As with your instrument technique, these ideas are often simple enough to apply, but you need to be shown them, or you can get into bad habits easily. Copyright © Robert Walker (UK). All rights reserved. This book is also available to read online as Many Ways to Use a Metronome on the Bounce Metronome wiki.